How often do you get so lucky that when you notice this creature resting on a thimbleberry leaf you walk right up to it and take a photo? Several photos? Thanks to the modern wonders of small digital cameras, it’s a clear detailed photo. I’m delighted. For a few weeks, this is one of the most common butterflies in mountain forests throughout Oregon, Washington, and Idaho. It’s also known as the Pale Swallowtail. The adults fly from from May to July, and lay eggs on plants that the caterpillars prefer: ceanothus, alder, and buckthorn. All three of these brush species thrive in the Beverly Creek drainage where I worked yesterday. As a trails professional, I am more than happy to share the brush with caterpillars. It grows faster than humans or insects can knock it back. 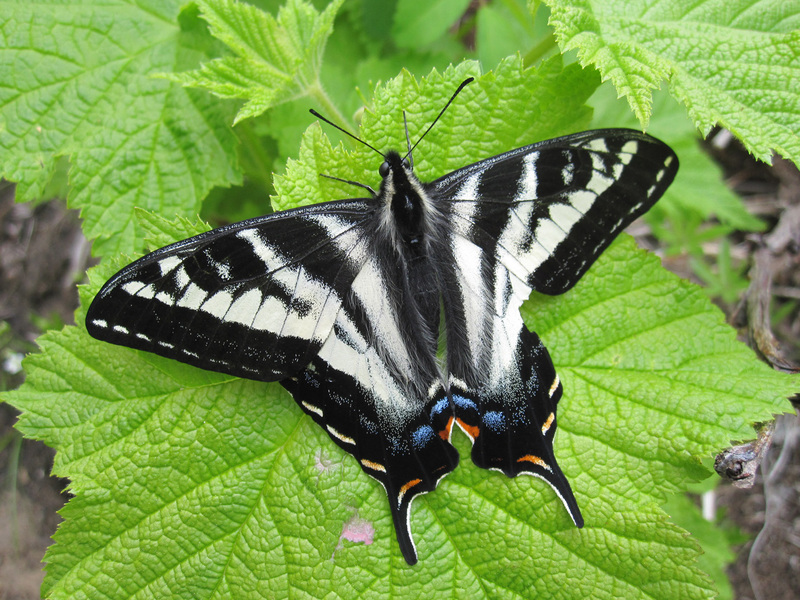 Swallowtails are showy and elegant, the largest butterflies in the Northwest. Like rainbows, butterflies are burdened by cultural interpretations and cliches. They are used as symbols of transformation, or added to drawings of princesses by little girls. I stand guilty as accused (at least for exploiting the symbol part). Letting all this baggage fall away, a person can observe these creatures as they are, in their habitat. They are pretty damn amazing, flittering around in high rugged places and surviving cold wet winters. I recall pulling a plywood sign out of a shed in January and finding a living butterfly resting against the wood. Most butterflies here overwinter as eggs or pupae in chrysalises, but a few tough it out as adults. I have been so fascinated by butterflies that I have stopped work to follow a fritillary through a meadow, or dropped my tools to get eye to eye with a Clodius Parnassian on a lupine. One of my best butterfly experiences was this: on Malcom Mountain working as a lookout on a backcountry fire. The helicopter dropped me on a dry rocky ridge in the morning, and I stayed all day watching the fire and the weather, using the radio to talk to the crews across the valley. A hummingbird flew up to my yellow shirt to see if I was a source of nectar. Bumblebees landed on my hands to touch their curled tongues to my sweat. And butterflies came to rest on my shoulders and hat, fluttering and fluttering those frail wild wings, waving their colors at the mountains and the sky. I held my breath and let it out, delighted.